A race of creatures who live by night face extermination. The Boxtrolls upholds a fine tradition of stop-motion animated films. Beginning with Tim Burton's The Nightmare Before Christmas (critically NOT directed by Tim Burton), and followed by nearly a dozen other notable efforts, stop-motion films have been consistently released to critical acclaim. And so it's something of a testament to the strength of the genre that The Boxtrolls is the least well-received film of its kind, despite favorable reviews. Indeed, like the many stop motion films that have preceded it, The Boxtrolls is charming, funny, and visually stunning. 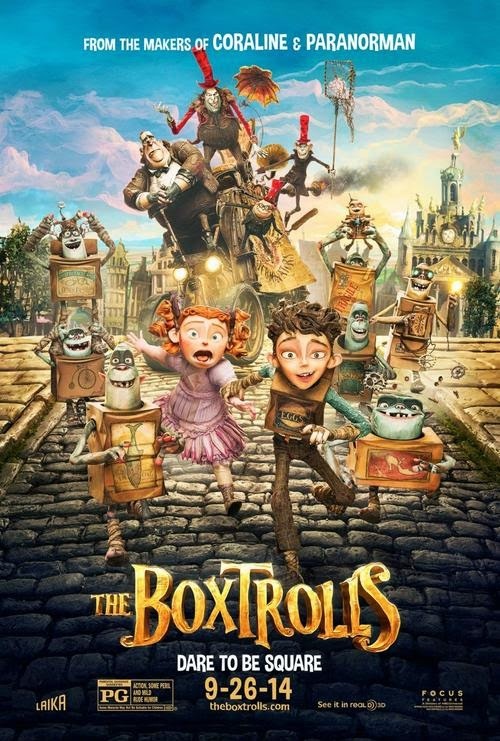 Every night, a race of creatures called boxtrolls (named for the boxes they wear as clothes) come out from hiding and plunder the streets of garbage and anything they happen to find that strikes their fancy. Among them is a boy named Eggs who thinks he's a boxtroll (his name comes from the label on his box). Unfortunately for Eggs and the boxtrolls, an evil man is in charge of exterminating every one of them, so the race begins to go into decline. But there's something strange about all of this, and Winnie - a young girl - is going to get to the bottom of this, along with Eggs. There are several reasons why I think The Boxtrolls has been received less warmly than other stop-motion films. For one, it's more childish. It's louder and sillier. There's lots of slapstick and an unusually high amount of gross-out gags. The premise isn't developed much, and there's a surprising lack of heart. Also, the finale consists of a great, big action sequence that's more loud and silly than satisfying or engaging. With all that being said, The Boxtrolls is still a delightful picture; allow me to explain quite why. The visual appearance of the film accounts for much of its charm (as is typically the case for stop-motion films). It's (needless to say) gorgeous; some sequences are unbelievably beautiful. And the character designs are hilariously fun. The overall art direction makes it look like it's come right out of a storybook. The Boxtrolls packs loads of visual splendor that's so strong it could carry the movie if the script wasn't already enough to do the job. That's not to say that the script is great, but it's very good. There's a bit of substance here (but not too much), and the gags usually find their mark. Even the gross-out gags work pretty well, never seeming too gratuitous or grating. Of course, the premise itself is very loosely explained. It's never understood why the boxtrolls must come out every night, other than desire for other people's junk. Surely the reason must be very important, since they're risking their night each time they leave their habitat. And as I mentioned, there's not as much heart as one might hope. The Tarzan-like origin for Eggs would suggest a more emotional, family-oriented storyline, but the film is low on profound moments. Most of the time, it aims to be a wacky adventure/comedy, and it works well in that respect. Still, one can't be faulted for being at least a little disappointed that it didn't embrace its more emotionally charged potential, especially after some very sweet opening moments. The characters are generally more distinctive and interesting than other animated films. While the boxtrolls themselves are more or less the same (they play out like ickier versions of the minions from Despicable Me), the human characters are fairly diverse, though not always intricate. Eggs is very likable, and his youth and naivety makes him feel a little different from other bland, heroic protagonists. Likewise, the spunky Winnie differs a little bit from the feminist crowd by suggesting a curious interest in grim stories and violence (fueled by malicious rumors of the boxtrolls). Various side characters are characterized by their lack of interest in younger children and their fondness for cheese. They never pay attention to our protagonists, no matter how important their discoveries are. Depending on the person, this will either be funny or frustrating. Likely both. By far the strongest character in the film is the villain, Archibald Snatcher. A sort of cross between Syndrome from The Incredibles and the title character from Wreck-It Ralph, Archibald is determined to earn himself a white cap (a sign of prestige), and is forced to be a wicked person (by killing the boxtrolls), so that he can be perceived as a respectable person. Though the character's resolution is a bit anti-climatic, the depth of this character exceeds that of many other animated villains. Likewise, Ben Kingsley's vocal performance as the villain is the standout of the cast. He's absolutely riotous at times, and one of the disguises he often dons - though completely unexplained - gives Kingsley a chance to be even more comedic and memorable. Isaac Hempstead-Wright and Elle Fanning are surprisingly strong in starring roles as Eggs and Winnie respectively. Nick Frost, Richard Ayoade, Tracy Morgan, and Simon Pegg are also wonderful in small roles. Dario Marianelli's score is very much like the film; a little wacky, but utterly charming. The main theme's strong similarity to a primary theme from Danny Elfman's Frankenweenie is not the only resemblance to Elfman's work, but the sound is suitable for the picture. It's enjoyably quirky and contains some colorful instrumentation to brighten things up. Definitely a noteworthy step into animation, as this is Marianelli's first score for the field. Yes, it's not as delightfully adult as Laika's Coraline (nor likely as much as ParaNorman which I have not yet seen), but it's a wonder all the same. I suspect The Boxtrolls will actually perform better with audiences in general, due to its less mature nature - and therefore, broader appeal. And yet it still retains that edge that has made Laika releases such an occasion. It's not the strongest stop motion film to grace the silver screen, but it's absolutely worth a trip to the cinema.